← Stack the States for Windows! Once your invention is complete, Monster Physics will render it with it’s built-in physics engine and let you actually operate your creation in real time. 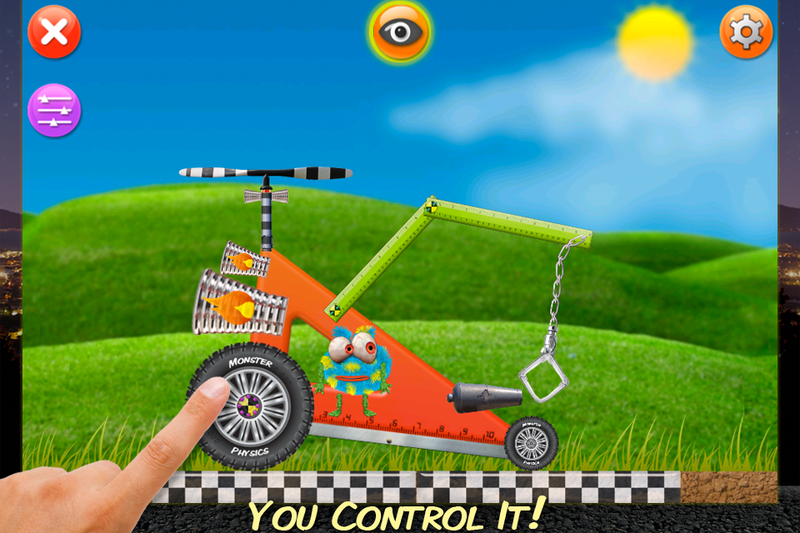 You can drive your car, operate your crane, guide your rocket into space or fly your helicopter! The possibilities are limited only by your imagination. 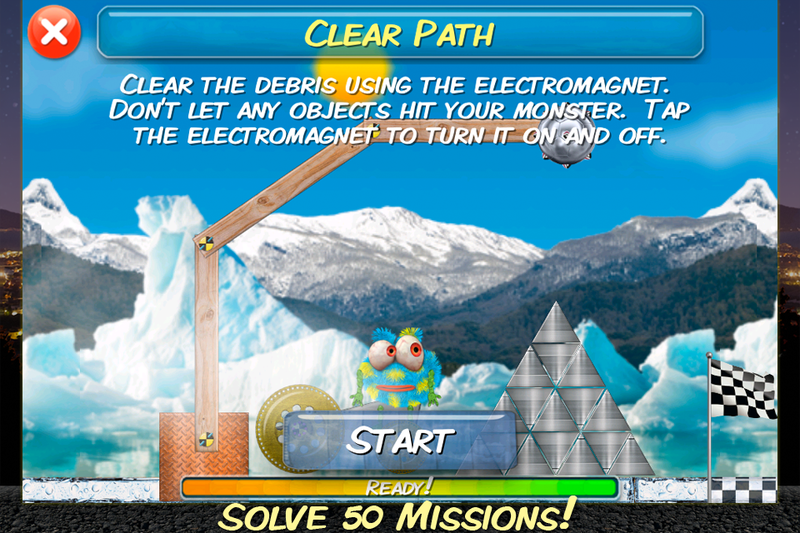 Monster Physics comes with 50 missions for you to solve including simple tutorials as well as mind-bending challenges. Many of the missions are open-ended and can be solved with a wide variety of different solutions so you can play them over and over again. Players will learn problem-solving and creative-thinking skills while having tons of fun. 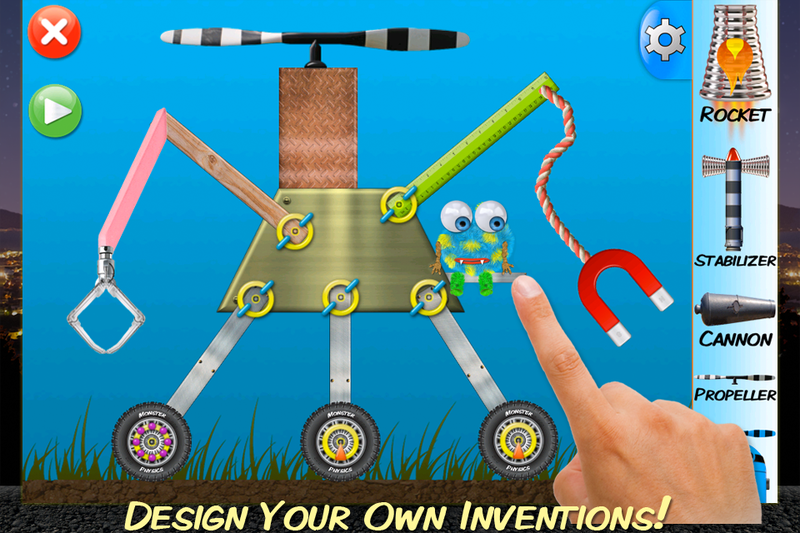 Players learn physics “hands on” through solving missions and building and refining their own inventions. 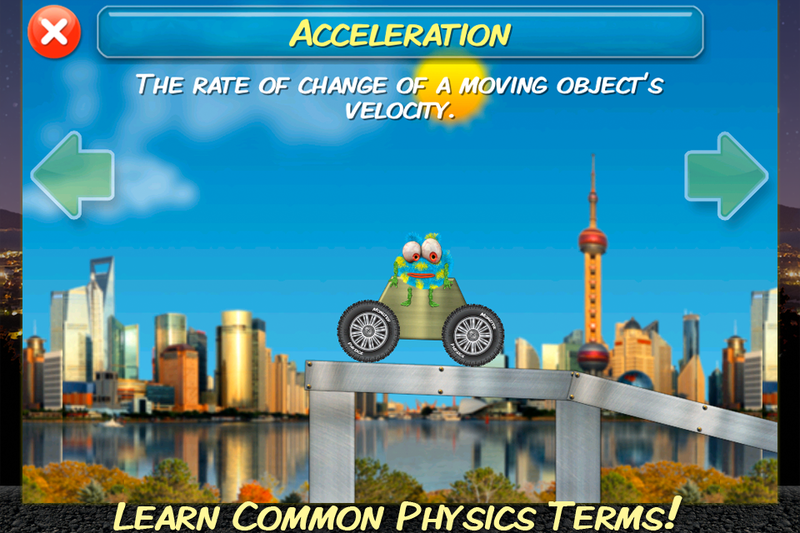 In addition, a separate learn section introduces players to basic physics concepts such as friction, force, mass, acceleration and more. This entry was posted in Games, Monster Physics. Bookmark the permalink. It is fabulous and fantastic. My son absolutely loves this. He plays on his own and sometimes we play it together. He is 7 and has played it for close to a year now. He has created over 50 inventions. I only wish I could record the inventions and upload to Facebook to share with family. The other day he build our house and a car and his fathers restaurant. The car drove from the house to the restaurant and back. He also built a replica of R2D2 and many other inventions. Thank you for this game! I also wanted to add that we are also big fans of stack the states, stack the countries and mathmateer which greatly helped my son with his math when he was having difficultly with the school’s teaching of addition and subtraction! Awesome! So glad my apps have helped your son. My grandson Aiden Ganzerworks@gmail.com is ten years old. He has a difficult time engaging in a lot of school activities . He loves your game. We work on projects together,this feels like an extension. We love your application. Thanks from or heart. Can you build and move machines underwater? Not at the moment, but that’s a great idea! ps If you haven’t watched the film “Into the Thunder Dragon” unicycling at it’s most extreme! Great work! My daughter (and I!) enjoy the challenges of the missions and making up machines. I like how the environment obeys physical laws and I use it to illustrate to her basic principals of physics. One thing I noticed missing is a spring element, preferably with adjustable spring constant but any kind of spring would be great. You have a real winner on your hands and I look forward to an update or in-app purchase with more missions. I’d be happy to be a beta tester! My 7 year old loves this game and talks about it every night they have free iPad time at school, but he can only play at school since we don’t have any Apple products at home. Do you have any plans to support Android? Two questions: how do you make fire in monster physics? And: can you tell me about monster physics Easter eggs? I got this app for my soon to be 5 year old grandson because of the reviews and the fact it looks like SO much fun! We have built our characters and created an invention but cant figure out how to make it move! Is there a tutorial anywhere on how to use the app or is it intended or smarter, more intuitive grandma’s than this 57 year old retired IT grandma that is dying to play but can’t figure it out!! :). PS graphics are AMAZING!! Will this be available for pc too?! Hi Wendy! Thanks for your note. At this time there are no plans to port Monster Physics to the PC. Hi Dan, thanks for the reply. Ive just stumbled across a link (below) suggesting to use Bluestacks (android emulator) to play Monster Physics android edition on your PC. Was monster physics ever released for android? Hi Wendy. Unfortunately, Monster Physics was never released for Android. Can this be transformed over to the Google Play store? Monster Physics was created using Apple-specific development tools. At the moment it’s only available for iOS.